↑ When will goal-line technology be introduced? Archived 9 July 2013 at the Wayback Machine. The total number of matches can be calculated using the formula n*(n-1) where n is the total number of teams. ↑ "United (versus Liverpool) Nations". The Observer. 6 January 2002. Retrieved 8 August 2006. ↑ "Clubs". Premier League. Retrieved 25 January 2018. ↑ "Is there more than one Premier League trophy?". Premier League. Archived from the original on 29 April 2014. Retrieved 29 April 2014. ↑ "Size and weight of the Barclays Premier League trophy". premierleague.com. Premier League. 12 March 2010. Archived from the original on 12 January 2016. Retrieved 16 May 2012. 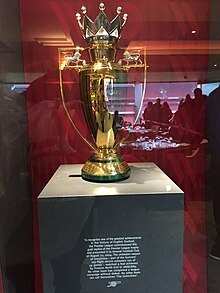 ↑ "The Premier League Trophy". Premier Skills. British Council. Retrieved 22 January 2013.